Michele Brouder is originally from the Buffalo, New York area. She has lived in the southwest of Ireland since 2006, except for a two-year stint in Florida. She makes her home with her husband, two boys, and a dog named Rover. Her go to place is, was, and will always be the beach. Any beach. Any weather. 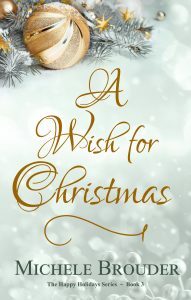 She is the author of The Happy Holiday Series as well as Claire Daly: The Soul Saver series. Her new series, Escape to Ireland, will be released in 2019.